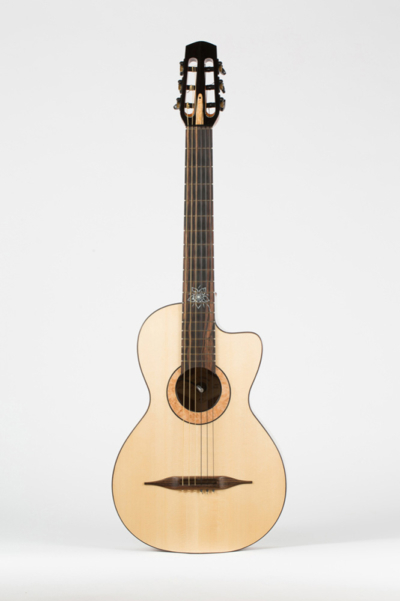 My name is Théo Kazourian, I am a guitar luthier based in Montréal, Québec, Canada specialized in the handcrafting of gypsy guitars and steel string acoustic guitars. I have an artisanal approach to the instruments I create, this means I am not trying to industrialize my process but rather trying to find more refined ways to create better acoustic guitars. I therefore voluntarily limit the number of guitars I am building every year, to ensure the highest quality standards. My main guitar line is composed of 4 acoustic guitars. I have created this line to cover different musical styles I’m attached to. It’s important for me to feel and understand the instruments I’m making for my customers in order to provide them the best guitar to express themselves. Working alone and essentially by hand, I thrive in crafting genuine custom made guitars. Every single guitar that leaves my workshop is unique and is the result of the craftsmanship that I have developed as a guitar luthier. If you choose to order one of my guitars your instrument will be the outcome of our close collaboration. I use your input throughout the process to make sure that the final result will match the instrument you need. You don’t just buy a guitar, you participate to its creation. I pride myself in using only top quality materials that I have personally selected. In order to reach the best sound quality possible I handpick every single piece of wood that I use in the making of a guitar. All the wood I use is stored in a temperature and humidity controlled room and aged for several years. Working alone and essentially by hand, I thrive in crafting genuine custom made guitars. Every single guitar that leaves my workshop is unique and is the result of the craftsmanship that I have developed as a guitar luthier. Your instrument is the result of the close collaboration I intent to build when you chose to acquire one of my guitar. I use your input throughout the process to make sure that the final result will match the instrument you envisioned. You don’t just buy a guitar, you participate in its creation. I pride myself in using only top quality materials that I have personally selected. I handpick every single piece of wood that I use in the making of a guitar, to offer a variety of sounds and design. The wood is stored in a temperature and humidity controlled room and age for several years. The first aspect we discuss is the type of sound that you are expecting, covering from musical style to the tessitura of your instrument. I give you a full assessment on the choices of woods to understand their characteristics and how they will play in your final instrument. Adapting specific elements such as the neck shape or scale length to make sure that you will feel comfortable playing this guitar for hours on. 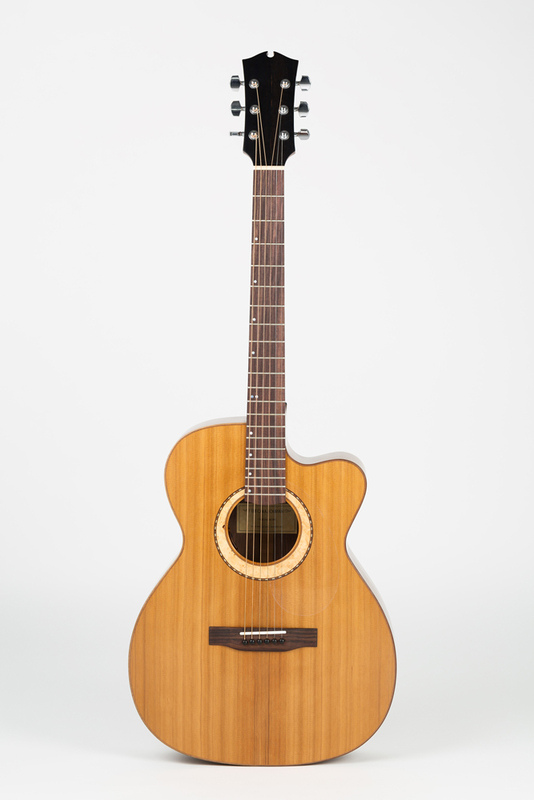 The design is based on the guitar line I have developed, modifications can be done to create an instrument that you will find unique. I offer a choice of devices to be fitted on your guitar from piezzo sensors to internal microphones. Different external preamps are also in option. Your guitar comes with a full lifetime guarantee which covers every defects of material and workmanship (some conditions apply). 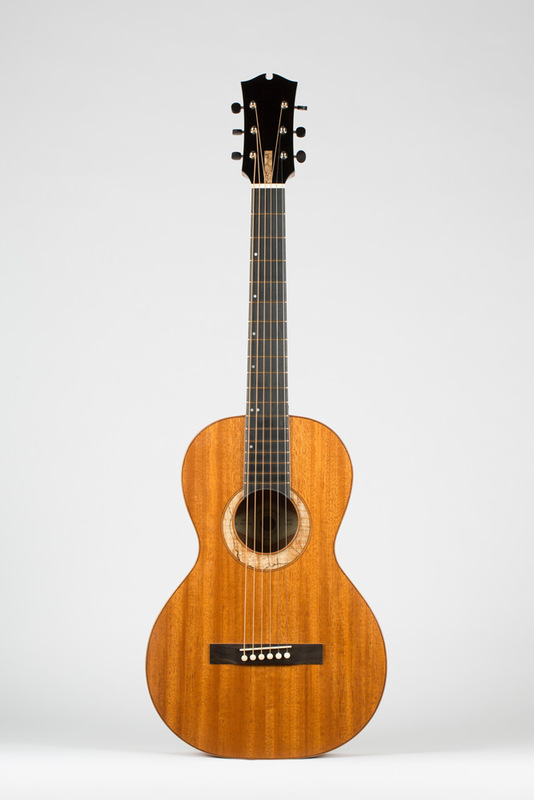 “My friends decided to offer me a “real” guitar made by a luthier for my 30 years anniversary… That’s how I met Theo. From the first meeting I enjoyed the idea of ​​being able to create my own instrument accompanied by a real passionate. We talked about what I wanted in terms of shape and sound. Thereafter Theo regularly sent me pictures of the building process so I was able to see gradually how the guitar was going. A few months later, I’ve received my instrument. 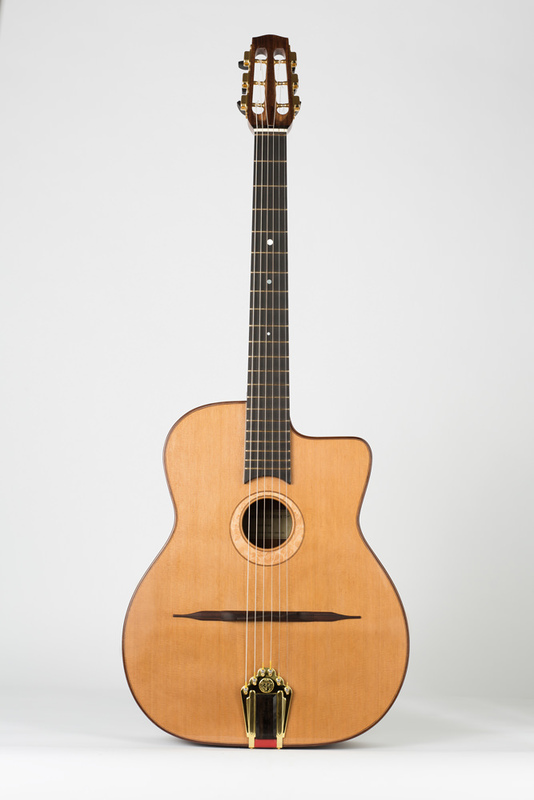 Jérémie Dumont, owner of an « Orkestra Model » guitar. round and precise bass, beautiful resonances in the midrange and warm and crystalline highs. That’s a guitar with many faces, with a strong projection for a small sized instrument. It’s got a good attack when played with a pick, and is intimist played with fingers. The ergonomy is very nice, the right balance, the finish is harmonious and the craft is flawless.